“Join the army, go to war,” were the words that popped into his head as he sat bored in Economics class. “It never left me,” he recalls, recounting the initial epiphany. Four months later, Goldsmith enlisted in the United States Armed Forces. He was 19. Goldsmith served in the army from 2004 to 2009, deploying to Iraq twice for year-long tours. He was a machine gunner for an Infantry fire team during the first tour; the second time around, he was a team leader and squad leader, steadily climbing the ranks from “Private” to “Sergeant” over the course of those five years. Still, his time in the army left a deep imprint on Goldsmith’s psyche. Upon leaving the military, he moved to Hawaii and began attending school on the G.I. Bill, studying philosophy. He also began to write…and write some more. War stories poured from his mind and onto paper, compiling into hundreds of pages worth of firsthand tales. The result is Zarqawi’s Ice Cream, a personal account of Goldsmith’s time in Iraq. Writing Zarqawi’s Ice Cream was Goldsmith’s means to a catharsis, a way to make sense of what he experienced as a soldier. The book is broken down into five parts, sequentially written from the time leading up to his enlistment to military training to combat in Iraq to Ranger School to combat again and finally, to his journey home. “Making stories out of traumatic, stressful, and extremely influential events in our lives helps us to process them, learn from them, and live with them,” he says. Since leaving the army and attempting to reintegrate back into civilian life, Goldsmith has been faced with a number of challenges, and in many ways, feels as though he hasn’t really left at all. The approximate release date of Zarqawi’s Ice Cream is May of 2011. Goldsmith will then embark on a 10,000 mile cross-country road trip for two months, promoting his book on military bases as well as in book stores. Aside from writing and philosophy, Goldsmith practices Gracie Jiu-Jitsu, a passion he began cultivating nearly ten years ago while growing up in Redondo Beach, CA. “I also like to ride my skateboard, read a lot, and take any opportunity I can to travel,” he enthuses. His impending book tour should satisfy the latter quite sufficiently! 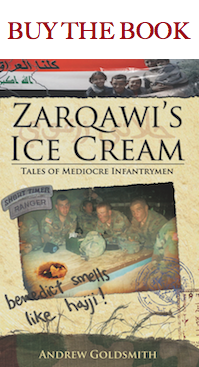 To learn more about Zarqawi’s Ice Cream and Andrew Goldsmith’s cross-country book tour, visit http://www.iraqwarstories.wordpress.com.